Mycosis fungoides is the most common form of cutaneous T cell lymphoma. Although normally presenting to physicians at an early stage and with an indolent course, mycosis fungoides can have a varied presentation. The National Comprehensive Cancer Network (NCCN) has created guidelines for the treatment and staging of mycosis fungoides. Although comprehensive, in practice these guidelines do not provide specific treatment regimens for lesions located in difficult locations and those recalcitrant to the recommended therapy. Because of this, suggestions based on the practices and decisions made at the multidisciplinary cutaneous lymphoma clinic at the Sidney Kimmel Cancer Center at Thomas Jefferson University, Philadelphia, PA, USA, are presented here. Lesions located in areas such as the face and intertriginous zones are often challenging to treat because first-line therapies are often inappropriate, with the locations increasing the possibility of side effects. Additionally, lesions located in the bathing suit distribution are often nonresponsive to first-line therapies for reasons still undetermined. Finally, although well-described, erythroderma secondary to mycosis fungoides is challenging to treat, with controversy surrounding various methods of control. This article both highlights difficult clinical scenarios and reviews the recommended treatment as provided by the NCCN guidelines and provides alternative therapy for lesions that are either difficult to treat because of the location or are recalcitrant to the recommended therapy. With suggestions for the apparent gaps in guidelines, providers can better treat patients who present with more complicated conditions. Robert Duffy and Tara Jennings contributed equally to this work. No external funding was used in the preparation of this manuscript. Robert Duffy, Tara Jennings, Saritha Kartan, Andrew Song, Wenyin Shi, Pierluigi Porcu, Onder Alpdogan, and Joya Sahu have no conflicts of interest that might be relevant to the contents of this manuscript. National Comprehensive Cancer Network. Mycosis Fungoides/Sezary Syndrome. (Version 4.2018). https://www.nccn.org/professionals/physician_gls/pdf/t-cell.pdf. Accessed 3 July 2018. Clobetasol. Lexi-Drugs. Lexicomp. Wolters Kluwer Health, Inc. Riverwoods. http://online.lexi.com. Accessed 28 July 2018. Piccinno R, Caccialanza M, Percivalle S. Minimal stage IA mycosis fungoides. Results of radiotherapy in 15 patients. J Dermatolog Treat. 2009;20(3):165–8. https://doi.org/10.1080/09546630802516571. César A, Cruz M, Mota A, Azevedo F. Erythroderma. A clinical and etiological study of 103 patients. 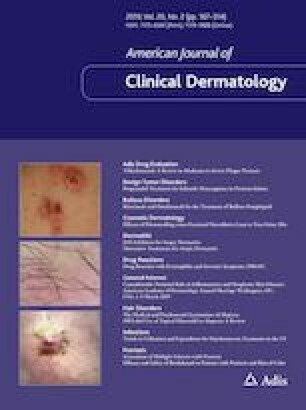 J Dermatol Case Rep. 2016 Mar 31;10(1):1-9. https://doi.org/10.3315/jdcr.2016.1222.